Note – For every tonne ordered for delivery we supply 2 cubic metres (which is the industry standard) at the above prices. Price includes cost of wood and GST. Two cubic metres = 2 1/2 standard trailer loads. Weight range factor depending on moisture and density = 0.8 tonnes to 1.1 tonnes. We supply two cubic metres (loosely loaded) regardless of weight but guarantee 2 1/2 standard trailer loads (loosely loaded) minimum. Two cubic metres of dry well seasoned wood is surely better than two cubic metres of heavy unseasoned green wood and of course the amount or volume of wood is the same irrespective of weight. We are not common carriers. Our responsibility ends at your boundry but all care is taken, we enter your property at your risk. 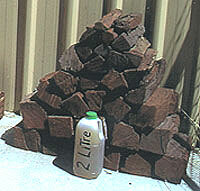 For the very finest in firewood in Perth, delivery or pickup, look no further than Oakford Firewood and Mulch. All of our firewood is sustainably sourced in an environmentally responsible way. We use only logs from regrowth areas, and never purchase logs from old growth forests. We are committed to sustainability in this industry, and are contracted to the Forest Products Commission. Our prices are extremely competitive as we use no middle men, and we use large trucks for safe and efficient handling of our product. Oakford Firewood and Mulch is proud to contribute to royalties and other costs which ensure that, unlike gas, forest products are a renewable resource. Regular: length between twenty five and thirty centimetres; may need further splitting after purchase. This is our regular production size. 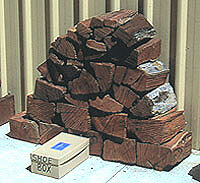 Firebox : these logs will fit an average size wood heater, and are approximately the same dimensions as a shoe box. Ready to Use: smaller in size than Firebox logs, these are approximately the same size as a two litre milk carton and will require no additional chopping or splitting after purchase. We also sell kindling by the bag. We supply two cubic metres of firewood per tonne ordered for delivery (this is the industry standard). This equates to two and a half trailer loads. GST is included in the price quoted. Actual weight ranges depending upon moisture content and density of the wood; our wood is dry and well seasoned and we always supply the same amount and volume of wood irrespective of actual weight. For the best firewood in Perth, contact Oakford Firewood and Mulch today. 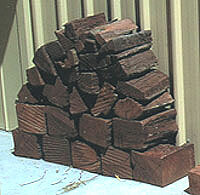 Our firewood delivery Perth-wide extends as far north as Wanneroo and as far south as Rockingham. Out of zone areas may be included with conditions applied. We deliver to your property; we will enter your property to complete delivery to a designated spot at your own risk and discretion, however our responsibility ends at your boundary.